After the beach our next favorite thing to do is probably to explore the local rivers, springs, and swamps. This area is blessed with lots of unspoiled and lightly used freshwater bodies you can just spend a few hours walking the shores of the Ochlockonee River or visiting the park at Wakulla Springs or you can spend hours on a rigorous wilderness canoe adventure in the Wacissa or Tate’s Hell. So if you can pull yourselves away from the beachhead for the freshwater. A few years ago on her way back from Wakulla Springs Rob’s mother was scanning the tabloid headlines while waiting to be checked out of the Crawfordville Winn Dixie. The cashier saw what she was doing and offered that she did not believe all of those stories were true. This got the attention of the bag boy and an interesting discussion, all in the local southern vernacular, ensued. Finally the checker and bag boy agreed that the alien abduction stories and others with a similar scientific basis were probably true, but it was just not possible that Brittney Spears could still be a virgin. A sure sign that the Florida school system teaches critical thinking. These pictures were taken on the Wakulla River by Craig Fugate and are placed here with his permission. These are some really good shots; we have some pictures but not this good. 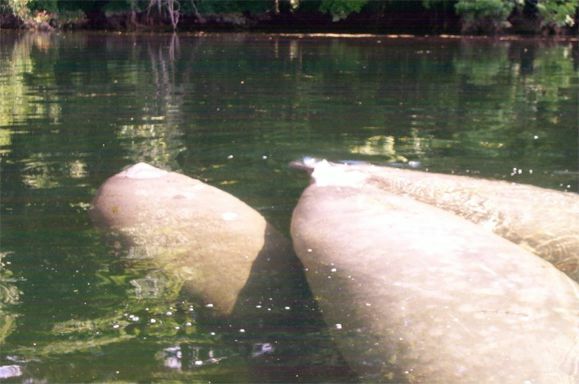 It is not hard to get this close to the manatees; it is just hard to get a good shot that shows their bodies below the water. It probably takes a polarizing filter, which we don't have. The Wacissa River: This is a smaller and much less known version of the Wakulla River. It's a little further to drive, but well worth it. Drive east on 98 about 10 miles past the St. Marks river bridge. Then turn north on 59 and go about 12 miles to the small town of Wacissa (not much of a town, just a few houses). You'll come to a stop sign and have to turn one way or the other, turn right to get to the springs, it's less than a mile from the stop sign. At the springs there is just a small county park with no services; there is a small launching ramp, a high dive, and a great (but probably dangerous) rope swing. The park has no attendant, so no fee and no lifeguard either. Just going to the springs and swimming is great fun, but more interesting is canoeing or taking a small (very small) boat down the river. If you do have a boat there are a number of small springs you can get to that are worth seeing, Rob's favorite is about half a mile down stream. On the left as you go down stream there is a small tributary, you will see the tell-tale sign of a spring in the noticeable flow of crystal clear water coming out of it. Follow up it about 200 yards and you'll be on one of the most beautiful springs we've ever seen. Someone has anchored a small swimming platform and put a really hazardous looking rope swing here. If you go to the Wacissa on a weekday you'll have it virtually to yourselves, on the weekend it becomes something of a red neck dipping vat, but that can be an interesting cultural experience, the natives are usually friendly. The Canoe Shop people (576-5335) in Tallahassee sometimes take a trailer of canoes down to the springs to rent, and can even arrange pickup down river. 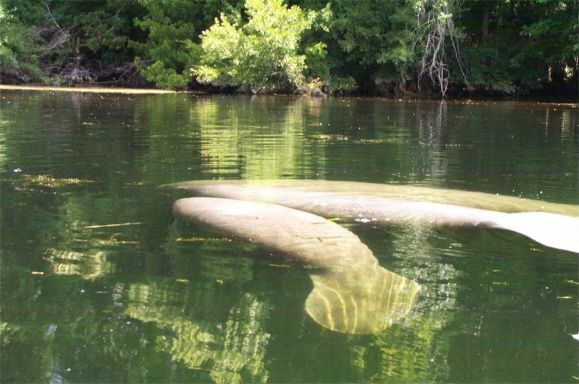 This is worth doing; the Wacissa has no Manatees (that we know of), but is one of the most virgin rivers in the south. You can rent canoes and car top carriers for the week from The Canoe Shop, this is worth considering there are lots of places you can canoe but where canoes are not rented. 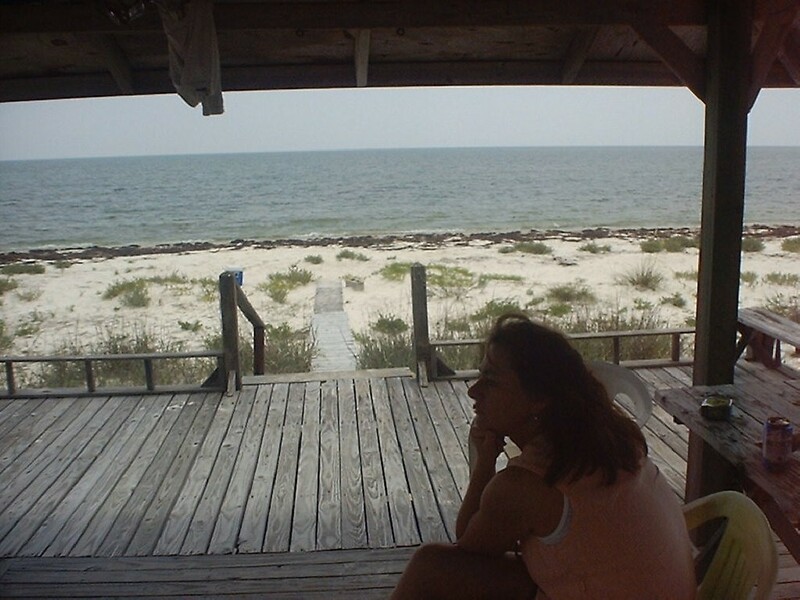 When it's calm we even canoe short distances into the Gulf in front of the house. On the way or the way back from the Wacissa you can take the dirt road from 59, about 5 miles south of Wacissa to the Natural Bridge monument. This is kind of interesting, the St. Marks flows underground into a limestone sinkhole, and reemerges about half a mile away. The sinkhole is right next to the road and interesting; you can't really get to the spot where it comes back up. This is also the site of a Civil War monument; the Yankees lost the battle for Tallahassee here. Not much really happened in Florida during the war, and this is one of the few monuments. From there we like to drive south on the dirt road to Newport, just before you get to Newport you pass by the Newport spring, another small limestone spring, kind of interesting, but not in the same class as Wakulla or Wacissa. Other rivers: We have three basic kinds of rivers, alluvial rivers, black water rivers, and spring fed rivers. Geologically most of Florida is karst limestone full of caves and fractures covered with a thin layer of sand. Most rain tends to soak into the ground rather than run off so unlike most of the eastern part of the US we have lots of springs and not many alluvial rivers. We do have lots of low-lying areas where the groundwater intersects the ground surface, these are usually swamps and the rivers that drain these are the black water rivers. The Wakulla and Wacissa are the largest spring fed rivers in the area. Spring fed rivers are clear and the water tends to be at a constant year round temperature of about 70 degrees. The flow in spring fed rivers is more constant than in either of the others, after very heavy rains the flow in the Wakulla may be two or three times low flow. Spring fed rivers are many people's favorites. Alluvial rivers like the Ochlockonee and Apalachicola are rivers with large drainage basins originating well up into Georgia. Florida really has only 3 major alluvial rivers, the other being the Suwannee. The Suwannee however is really a mix of all three kinds of rivers, part alluvial, part spring fed and part black water. Alluvial rivers are the largest rivers in Florida and carry the most sediment. Their flow will vary greatly depending on season and rainfall; variation from high to low can be ten or one hundred times or more. Black water rivers are rivers like the Sopchoppy (http://www.littletownmart.com/fdh/sopchoppy.htm) or New River that drain cypress swamps and low land, the result is that the water has a lot of tannic acid and is dark. These tend to be low flow rivers, and during a dry period they may nearly dry up. The Fenholloway River that flows from Perry to the Gulf (about 80 miles from Alligator Point is probably the blackest water you will ever see in a river, unfortunately it is not all natural. The Fenholloway is naturally a black water river, but it has been getting wastewater from a paper mill for many years, this is a very black discharge and has turned the river even blacker. It is a shame, the Fenholloway is a beautiful river, but it is now the only river in the state of Florida with a major industrial pollution problem. Tate's Hell Swamp: This is a large and very difficult to traverse swamp located a few miles northwest of Alligator Point. You will see it on area maps, the only way in we know of is by boat, canoe is probably the most practical. Part of it is a legal wilderness so no motorboats, but then you probably couldn't get a motorboat through anyway. Legend has it that in the 20's a logger got lost in the swamp and for days wandered in waist to chest deep water and mud. He was bitten numerous times by snakes, probably water moccasins. Finally he stumbled out to the Gulf Coast near East Point and when he was found he said: "My name is Tate and I've been to Hell". Then he died. We can't stand behind the historical accuracy of the story, but we like it. Rent a Canoe: There are lots of canoe trips you can take. The Canoe Shop in Tallahassee (1115-B W. Orange Ave. Tallahassee, FL 32310 (850) 576-5335) will rent you a canoe and carrier equipment for the week and if you like to canoe there are lots of possibilities. We have written about a few of our favorites below, if you do some exploring you will find a lot more. You can also rent canoes for shorter trips locally at the hwy 98 bridge and other places. Kayaks are becoming increasingly popular and although Alligator Point is about 30 years behind the rest of the world we are starting to see a few kayaks. You may be able to rent them from The Canoe Shop as well. We are not kayak people so we don't know much about them, but the people we see in them seem to get around faster and easier than we do in our canoes. Another local canoeing and kayaking outfitter is Broke-a-Toe's (850-229-9283) located west of Apalachicola, about an hours drive away. We have never done business with them, but they seem to offer some unique things, like horse back riding on the beach and St Vincent Island tours. One of our renters was having breakfast in Panacea when he came across a local redneck proudly displaying twenty alligator teeth slung about his neck in a decorative fashion. "I guess you must prize alligator teeth the way some people value pearls," said the renter. "More so," said the redneck. "Anyone can open up an oyster."